There are 500 million smallholder farmers in the world, most of whom live on less than $1 a day. Small-scale farmers are highly vulnerable to the effects of climate change – and they face many challenges including lack of access to traditional markets, agricultural inputs, and finance. Every day small-scale farmers develop a diverse range of innovative, low-cost solutions in response to the many challenges that they face. But with the majority of farmers living in remote areas without internet access, they could not share this information with other farmers, until now. 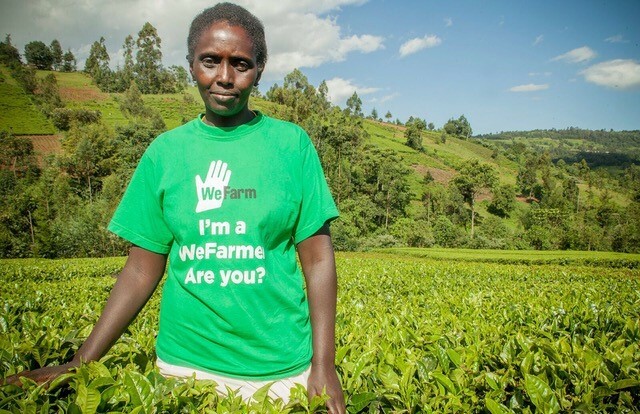 Created in 2016 as a project for the Cafédirect Producers’ Foundation (CPF), a UK-based non-profit, WeFarm has since spun out to form its own venture-capital backed social enterprise. WeFarm is a free peer-to-peer knowledge sharing service that enables farmers to exchange information via SMS – without the internet and without having to leave their farm. Farmers can ask questions about anything agricultural and receive crowd-sourced answers from other farmers around the world in minutes. How WeFarm works is simple. Take, for example, farmer Rose in Kenya. Rose’s crop is suffering from a disease, so she sends a simple, free SMS to the local WeFarm number, outlining the symptoms of her problem. Her question is instantly posted online and sent to selected members of the WeFarm community via SMS. Joseph, who is suffering the same problem in Uganda, poses a solution he has recently found for that very thing. Rose receives useful, relevant knowledge within minutes – and Victor receives confirmation that his knowledge is valuable. To be able to quickly provide responses, WeFarm is bringing machine learning and crowd-sourcing to these offline populations since 99% of users are using WeFarm through SMS. When a farmer asks a question it goes through an SMS aggregator. An API then allows WeFarm to consolidate the aggregator into a uniformed method. AWS Lambda takes the inbound messages and creates a queue. Then there is the process of cleaning the data and spell-checking, which can be a challenge since a lot of these questions are in exotic languages, like Swahili. The question is run through a series of filters and algorithms such as the location, intention, and the use that information in order to direct that question to 10 people in the network who would be best able to answer the question. Then, they also rate responders tagging them with timeliness, language, and who has responded well in the past. So whether a farmer in Peru has a problem with coffee plants or another farmer in Uganda has a problem with diseased sweet potato plants, they can get the answers they need. Using AWS services like AWS Lambda, Amazon Elastic Compute Cloud (Amazon EC2), Amazon Relational Database Service (Amazon RDS), Amazon API Gateway, and Amazon Simple Queue Service (SQS), WeFarm is able to interact with 7000-8000 users per day and has reached over 24 million interactions since it launched. They keep a live activity tracker here. “AWS has been a tremendous asset for our ability to scale quickly and still maintain quality of service. Without efficient and effective back-end technology, it would be impossible for us to bring our services to the world’s small holder farmers,” said Kenny Ewan, CEO, WeFarm. Currently, WeFarm is serving one of the largest populations in the world of agriculture with a mandate to scale their network, but looking ahead they see commercial use of the data produced from the more than 24 million pieces of information exchanged via SMS. WeFarm plans to turn the data collected into socially-valuable insight – focusing on everything from tracking disease to predicting global food crises. Learn more about WeFarm here.